The freezer is located at eye level on top of the refrigerator section. The freezer is located at the bottom and can open with either a swing door or pull out drawer, depending on the model. The top refrigerator compartment offers a single door that is ideal for storing items of a variety of sizes, including beverages and condiments. You can even choose a left or right swing door to accommodate your kitchen layout. Eye-level visibility and access to fresh foods versus a Top Freezer, without having to bend down to access them. This sleek design has two refrigerator doors side-by-side that swing open like French doors. The freezer is conveniently located on the bottom with a pull-out drawer. A stylish look with the freezer and refrigerator placed next to each other vertically, providing convenient eye-level access to both refrigerator and freezer. To make sure you get a perfect fit for your home, you will need to measure the space you have for the refrigerator carefully. 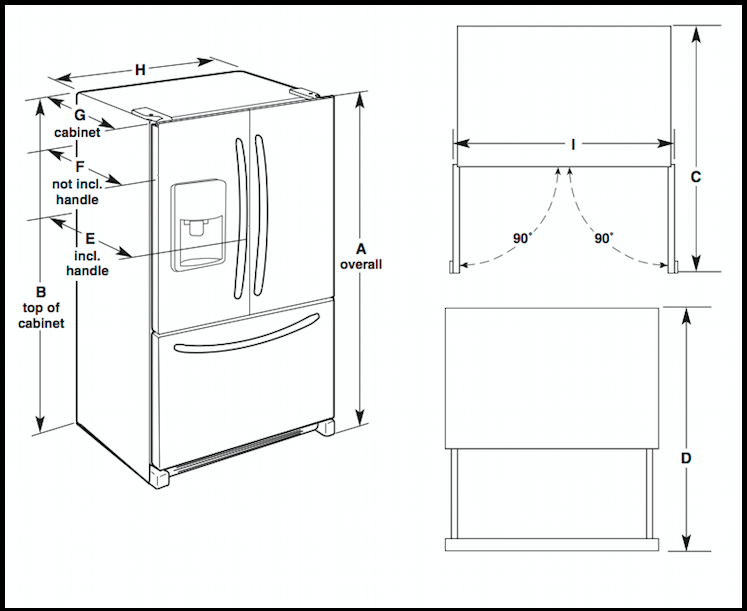 As fridges come in many width and height configurations, measuring correctly is very important. 1. 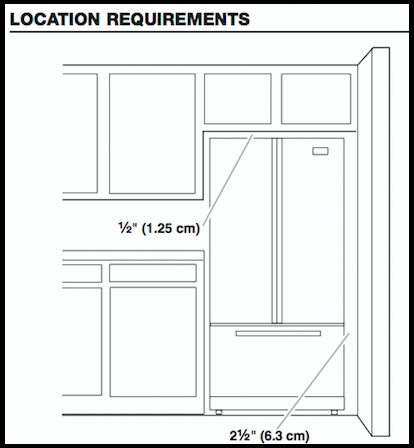 Measure the width, height, and depth of the refrigerator space. 2. Measure the hinge space where the door swings open. This needs to have approximately 2 inches (5.08 cm) of clearance so that the doors can swing freely. 3. Measure the door opening space in front of the fridge to ensure the door will be able to open fully. 4. Account for ventilation space; there should be at least 1 inch (2.54 cm) of extra room for the refrigerator at the top and back to allow proper airflow all around. 5. Ensure your refrigerator will fit through any doorways, hallways, and stairs it may need to pass through to be set in place. • Common widths include 24”, 30”, 33”, 36”, 42”, 48” (61cm, 76cm, 84cm, 92cm, 107cm, 122cm). • Most products will have specific guides for fridge dimensions that can be found online that help you confirm the dimensions you need for your space. Humidity control drawers – These drawers come in different sizes and quantities, depending on the refrigerator. They allow you to adjust the humidity level of the compartment, keeping your produce at the optimal freshness for a longer period of time. Produce preserver options – Absorb ethylene gas omitted by certain fruits and vegetables in the crispers to extend the freshness of your produce. Programmable temperature controls – In order to best store your meats, fish, beverages and vegetables, controls allow you to adjust how cold certain areas of your fridge are to suit your grocery needs. Normally found on crispers, pantries, and French Door fridges with 4 or 5 drawer configurations. Air filtration systems – Filters built into the fridge can help eliminate bacteria and odours to help keep your refrigerator smelling fresh. Look for features that make it easy for you to keep your foods neatly displayed and easy to find. Adjustable shelving – Flexibility in adjusting shelves is important when storing a variety of items of different heights, whether they are party platters or milk cartons. Size of door bins – Can help make your beverages, condiments and items you want to be accessed quickly easy to grab, while maximizing your refrigerator space. Extra spaces like pantry drawers, deli shelves, and temperature-control drawers can provide a variety of options for storing various foods. Pantry drawers are great to store deli platters and appetizer trays easily. Tiered shelving in the freezer helps improve storing and retrieving of your favourite frozen food items. Some fridges come with the option of dispensing filtered water and ice. This feature requires you to have a water line available to connect to your refrigerator. External Water and/or Ice Dispenser: A convenient option where the dispenser is located on the exterior of the refrigerator. Perfect for those who get thirsty often, this dispenses both filtered water and ice without having to open the refrigerator door. Offered features include measured fill and cube and crushed ice options. Internal Water and Ice Dispensers: The Filtered Water dispenser is accessed from inside the refrigerator. The icemaker located in the freezer dispenses filtered ice into a bin where it is stored for easy access for whenever you need it. 2. Check the number.For appliances, the number is a measure of consumption, not efficiency: the lower the number, the better. 3. Use the scale.The scale identifies, at a glance, the models’ energy performance compared to similar models. (The further left the pointer is on the scale, the better).